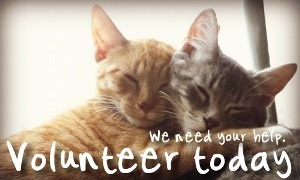 LOA is looking for volunteers to help take care of our cats when they stay at Petsense during the week. If interested, please fill out the form below and our volunteer coordinator will get back with you within five days. *LOA is happy to have volunteers of all ages. If you are 16 and younger we ask that you partner with a parent or older sibling that is over the age of 18 to help care for our cats.